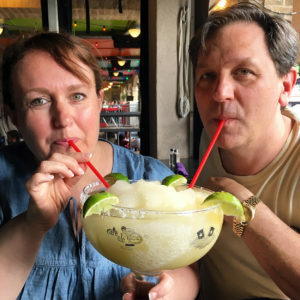 By now, you probably know my family recently spent a week exploring Texas AND that I’m sharing my food journal of all the eating experiences we had while in the LoneStar State! If you missed it, click here to read about Austin and here to read about Waco. 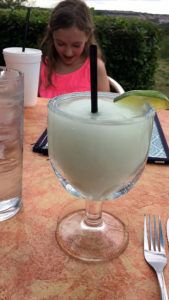 Today, I’m sharing queso, margaritas, and gelato in San Antonio! 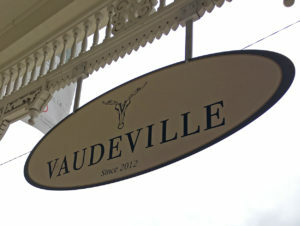 Vaudeville…This upscale bistro is located in Fredericksburg, about an hour outside of San Antonio. The restaurant is located in the basement, with the main floor being a lovely retail store…definitely allow time for browsing! 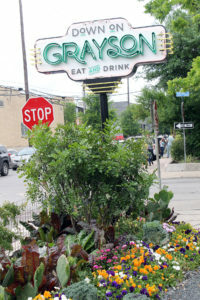 The menu is a combination of reinvented classics and items from local farmers and ranchers. I ordered the V Reuben on Marble Rye, and let me just say it is the BEST reuben I’ve ever had! 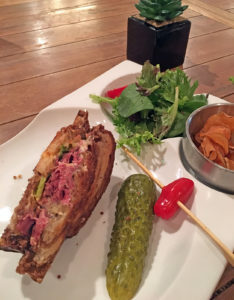 They make it with pastrami, but the big difference is the brussel sprout kraut on the sandwich…so flavorful and the texture gives the sandwich a little something extra. Aldaco’s…We went here on the recommendation of one of my husband’s college friends, who has lived in San Antonio for nearly 20 years. I think it was more about the views than about the food, though. You can sit outside on the patio from one of the highest points in San Antonio. It was really a beautiful evening, and we definitely enjoyed the views! 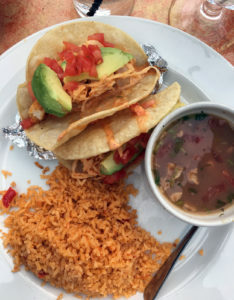 I ordered the Tacos Del Mar (which are shrimp tacos) and a margarita. The food was good, the margarita was even better, but I think it was more about the beautiful view of San Antonio. Down on Grayson…Our friends, who had relocated to San Antonio from Toledo almost three years ago AND who were hosting us during our visit, suggested we experience the Pearl area during our stay. The Pearl is a revitalized neighborhood in San Antonio with restaurants, cafes, retail businesses, live music, and a farmer’s market. It has a really fun atmosphere! 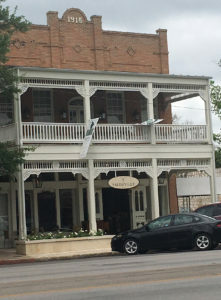 While there, we enjoyed lunch at Down on Grayson…a casual, American restaurant with indoor and outdoor seating. Of course, we sat outside. 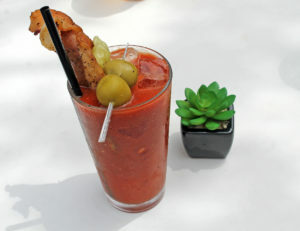 And of course (because it was the weekend), I had a Bloody Mary…the BEST Bloody Mary I’ve ever tasted!! Bacon AND olives…yum! 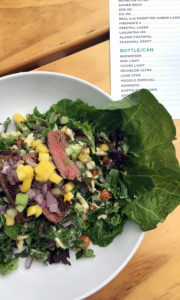 For lunch, I ordered the Thai Steak Salad (a mixture of marinated filet, mango, greens, and almonds) and it was just delicious. I can’t say enough about this place…great food, drinks, and atmosphere! 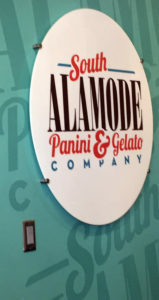 South Alamode Panini & Gelato Company…Our friends LOVE this place, and I can see why! 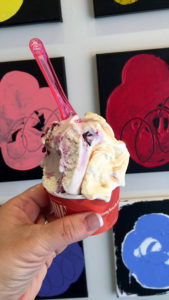 The owner lived in Italy and studied as a gelato apprentice. Most ingredients are imported from Italy, with everything else being sourced locally. So who would have thought that we would have found authentic gelato in the middle of Texas! I ordered the Ricotta Blackberry and the Goat Cheese, Caramel and Cashew. I’m not sure which one was my favorite…both were soooo good! 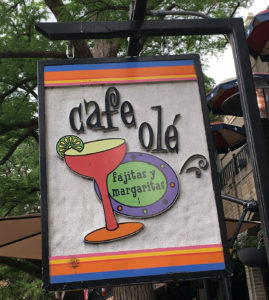 Cafe Ole…After exploring the Riverwalk one warm afternoon, we were ready for a relaxing beverage and we found just that here! 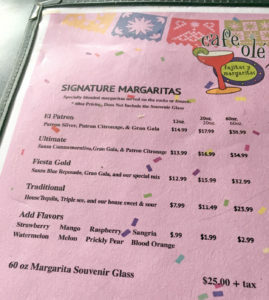 After my husband and I each ordered a margarita, the server talked us into sharing their specialty 60 ounce margarita…yep, I said 60 ounces. And since we were on vacation, we said “why not!” It was so refreshing, and a great accompaniment to the queso and chips. And the perfect setting…enjoying the views of the Riverwalk! 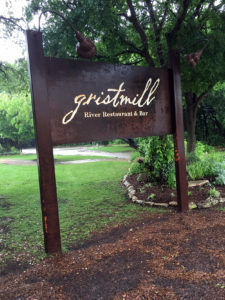 Gristmill River Restaurant…This restaurant, which is in an historic building in Gruene, is a multi-level structure located in a grove of trees with great views of the river below. We were there on a very rainy day, so it was difficult to enjoy the outside…however, I’m sure the atmosphere is wonderful when the large glass doors are open to the outside. We ordered queso and chips as a starter. 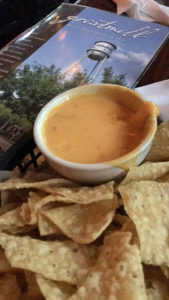 Now we ate A LOT of queso and chips during our week in Texas, but I thought these were the best…the chips were warm and homemade AND the queso had a great flavor! 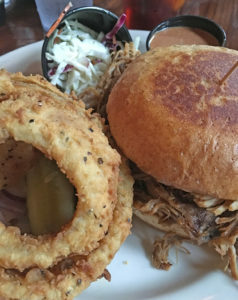 For lunch, I ordered a pulled pork sandwich and onion rings. Once again, great tangy flavor! The Hoppy Monk…This is not your typical Texas eating establishment…not so much of a BBQ place, but more of a farm-to-table menu. 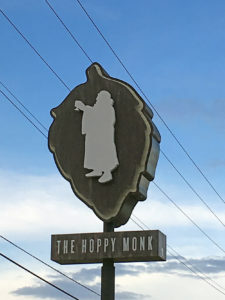 It is also known for it’s wide variety of beers…hence, the ‘hoppy’ monk. 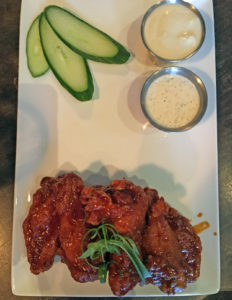 Our friends suggested we try the chicken wings (sweet and savory and marinated in spicy gochujang sauce)…so yummy! For dinner, I had the Ricotta and Apple Salad. 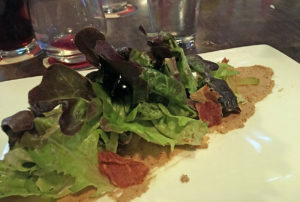 With pistachio ricotta and compressed apples mixed in red oak lettuce and lemon vinaigrette, it is definitely a unique combination of ingredients. I did like it, and it was nice to have a salad after all the heavy food we had been eating. 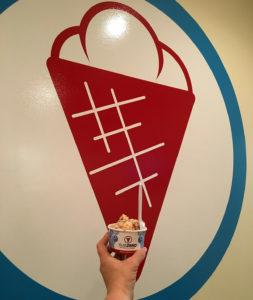 Sub Zero Ice Cream and Yogurt…This ice cream place is more about the experience than the taste…although, it did taste pretty good! 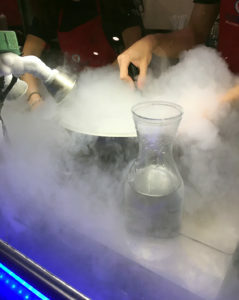 They make the ice cream right in front of you using liquid nitrogen. So fun seeing all the vapor go up in the air as it is created! And I’m here to tell you the Peanut Butter Bonds was delish! L Taco…Besides our friends from Toledo and my husband’s college friend, we have another friend who lives in San Antonio…I taught second grade with her way back before we both had kids and moved away. In fact, we hadn’t seen each other in 20 years! 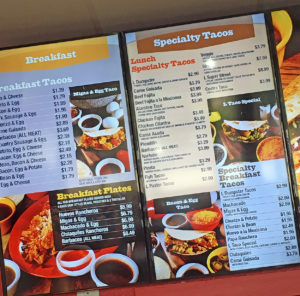 She told us we must have a breakfast burrito while in Texas, and she suggested this taco place. 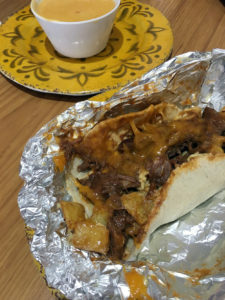 I had the L Dumpster Breakfast Taco, which has egg, potato, beans, bacon, and cheese in it. Interesting combination and I can say I tried it!